← Wrapping Up Academic Year 2017-18 — Congratulations, Graduates! Prior to joining the Clinic last year, our own Kendra Albert helped to draft and file an amicus brief in Carpenter on behalf of Data & Society and fifteen individual scholars—including a number of members of the extended Berkman Klein Center community (Ifoema Ajunwa, Meryl Alper, and danah boyd, among others). The Cyberlaw Clinic previously filed amicus briefs in a pair of Massachusetts Supreme Judicial Court cases that addressed similar issues — Commonwealth v. Augustine (brief filed on behalf of the Electronic Frontier Foundation) and Commonwealth v. Estabrook — (brief filed on behalf of the Electronic Frontier Foundation and the American Civil Liberties Union of Massachusetts).The outcomes in those cases presaged the majority’s decision in Carpenter. To quote Paul Ohm, it seems likely that Carpenter represents a significant “inflection point” in Fourth Amendment jurisprudence and that we will talk about Fourth Amendment law “before-Carpenter and after-Carpenter for a long time, at least for cases involving technology.” The Clinic looks forward to watching (and being involved with) future developments on behalf of our many clients and collaborators with a keen interest in privacy and government surveillance. 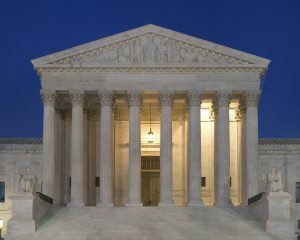 Supreme Court image courtesy Pixabay user, Skeeze, CC0.